Quick suggetion, the original ROMs were 8k*8, and the Flash is 256k*8, according to the linked site. So how about adding switches to the five additional address lines, and having 32 different ROM images in the one Flash? Ooooh, very clever if it works! I do like this idea very much! Rather than using a microcontroller, use a hexadecimal switch! Maybe not, they’re disproportionately expensive. I like the way they look, though. Maybe use one of the reset-based detectors. Or add a menu and a latch. Good idea! I like the low tech approach :) I happen to have a few hex-encoders here. I got them $1 a piece. We used to do that back in the day. there were a lot of “bootleg” rom cars around and you could buy multiple rom cartridges, you flipped the dip switch and then plugged it in. For the address lines, ignore as in floating or ignore as in pulled low? Yeah, unused address lines need to be pulled low otherwise reads will go randomly all over the memory. To echo the first commenter, this is *very* cool. This might be the ticket to fixing-up my ol’ Tek 7854 ‘scope using new parts, with the added benefit of playing with the firmware on-the-fly (for no reason other than ‘why not’). If you get a little more complicated and use a register for the additional address lines (mapped to some memory location) you could switch out the ROM images in software and even have menus for the contents of the flash. Using an extender board, I used to do this with static RAM that I’d load the program into using the BASIC interface and floppy drive, then do a soft reset to start execution of the what was stored in RAM. I bet that was awesome! Modems never took off in the UK, for the first few years I was on the Internet we had to pay by the minute for the phone call. Didn’t the VIC-20 only have 3.5k RAM? An unexpanded VIC-20 has 5kB of RAM of which 3.5kB can be used for BASIC programs. 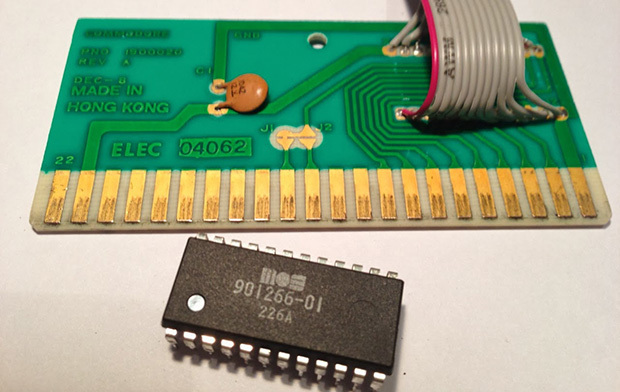 Could you please tell me the J2 trace on the cartridge board connected to which pin of the original 8K ROM chip? Thanks!